- Vol. I, no. 1 (March 2, 1943)-vol. II, no. 45 (June 6, 1944). - Also issued on microfilm from the Library of Congress, Photoduplication Service, and the State Historical Society of Wisconsin. Denson Tribune . (Denson, AR), Oct. 22 1943. https://0-www.loc.gov.oasys.lib.oxy.edu/item/sn82016475/1943-10-22/ed-1/. 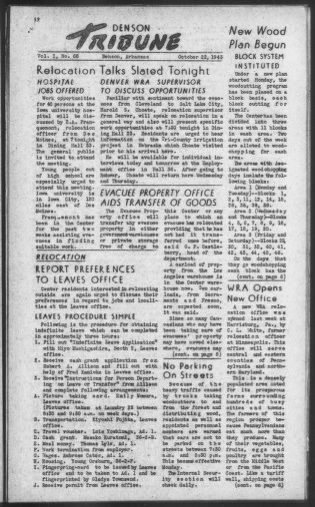 (1943, October 22) Denson Tribune . Retrieved from the Library of Congress, https://0-www.loc.gov.oasys.lib.oxy.edu/item/sn82016475/1943-10-22/ed-1/. Denson Tribune . (Denson, AR) 22 Oct. 1943. Retrieved from the Library of Congress, www.loc.gov/item/sn82016475/1943-10-22/ed-1/. Cotton gin at Jerome, Arkansas 1 negative : nitrate ; 3 1/4 x 4 1/4 inches or smaller. Shed for agricultural machinery. Jerome, Arkansas 1 negative : nitrate ; 3 1/4 x 4 1/4 inches or smaller. Ginning machinery. Jerome, Arkansas 1 negative : nitrate ; 3 1/4 x 4 1/4 inches or smaller.